The kiss is a central image of Jugendstil, the German counterpart of Art Nouveau. This all-embracing style took its name from the magazine Jugend, founded in Munich in 1896, which espoused the new movement. In Berlin at the same time, the literary-artistic journal Pan was equally instrumental in promoting the Jugendstil aesthetic, and it was inside the magazine’s pages (vol iv, no 2, 1898) that this quintessential colour woodcut first appeared. Much favoured by the Symbolists, the theme of kissing lovers was also famously treated by Edvard Munch and Gustav Klimt, to name but two succeeding examples. 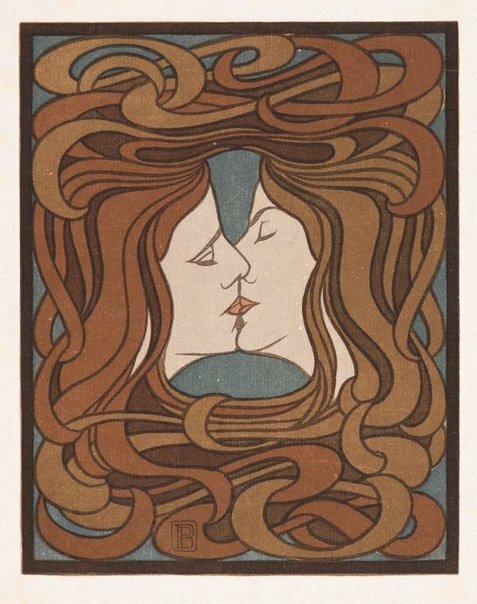 Behrens made this print during his early and most committed adherence to Jugendstil when he was set on becoming a painter and graphic artist. The simplification of the design into pure, flat patterns accentuates the motif of the kissing couple whose profiles are framed by trademark ‘whiplash’ curves formed by their voluptuous tresses. The sensuous interweaving of hair not only conveys the intensity of the lovers’ abandonment in each other but also seems to suggest the ancient understanding of the kiss as an intermixing and exchanging of souls. The gender ambiguity of the couple adds further to the fascination of the image. Certainly there was a prevalence of androgynous figures represented in literary and artistic works during the fin-de-siècle, exalted for their supposedly higher artistic and spiritual sensitivities. Like other leading Jugendstil artists, Behrens was remarkably versatile, designing glassware, jewellery, furniture, wallpaper, typefaces and theatre sets. However, by the first decade of the new century he had cast off the vestiges of his youthful style and architecture became his main vocation, counting among his pupils the modernists Walter Gropius and Le Corbusier. Signed l.c. image, [incised block] "PB". Not dated. Prints & drawings Europe 1500-1900 , Sydney, 2014, col illus p 182.